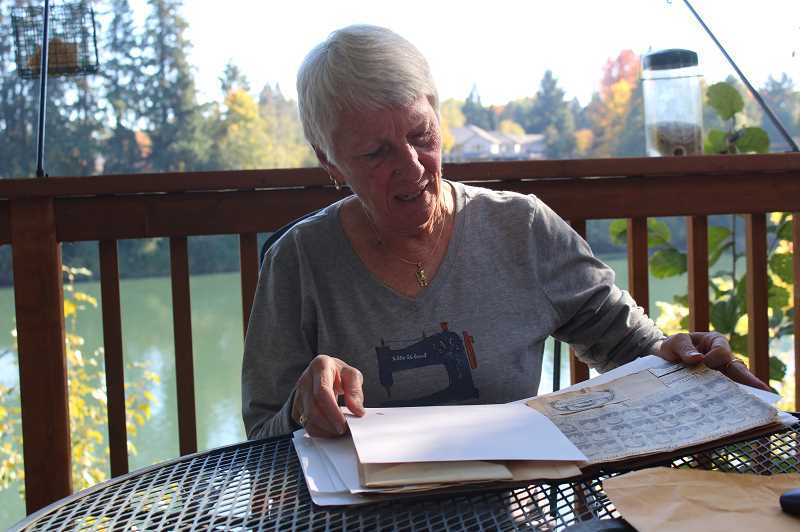 Sitting on the back porch of her Wilsonville home — with her back facing the Willamette River — Cathie Gleeson thumbs through a weathered scrapbook that provides a detailed portrait of her father as a young man. 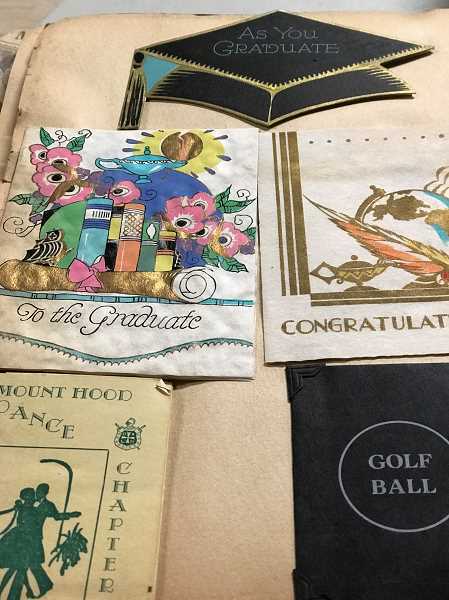 Ben Buck's report cards, graduation certificates, party invitations and childhood and early adulthood photos dating back to the early 20th century — none of which Gleeson had ever seen before — are enclosed within the pages. Though interested in Buck's historical minutia, Gleeson is more fascinated by the history of the scrapbook itself. How did it end up in the local historical society's archives? Why has she never seen it before? Why does it only document her father's early years? "I just find the whole thing random," Gleeson says. "It's like it fell out of the sky." Earlier this year, the Wilsonville-Boones Ferry Historical Society set out to catalogue its trove of archival material, which was previously stored in a disheveled corner in the Wilsonville Public Library attic. Through the process, they found items integral to the city's history, which they hope to display once the collection is fully organized and finds a home. But they also found items, like the Buck scrapbook, that weren't even tangentially related to the city. Historical Society Vice President Susan Schenk happened upon the scrapbook while sorting through a pile of the archive's most extraneous items. After looking through it, she determined that it didn't have any relation to Wilsonville history. But she thought, to someone, it might hold sentimental value. So Schenk decided to investigate. "Probably (I took interest in it) because I don't have any scrapbooks or photos of any significance of my parents or grandparents," Schenk says. "I thought someone out there might want this. It reflected a time in the '30s and '40s when life was very different in Portland. It was just a little time capsule." A picture inside the scrapbook of Buck standing next to an ambulance that said "Buck Ambulance" provided the key clue. 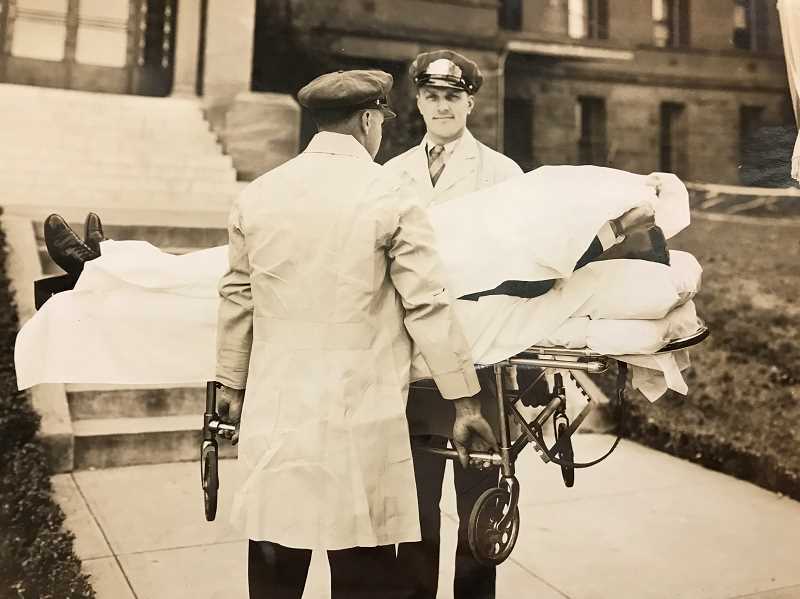 Schenk looked up Buck Ambulance, which was an emergency vehicle service located in Northeast Portland in the early 20th century, online and found that it had been sold to American Medical Response. So Schenk contacted AMR Manager Randy Lower. And after Lower returned from his relief efforts in the Southern United States during Hurricane Florence, he took the scrapbook — hoping it would include historical remnants of AMR's early history. Instead, it mostly consisted of family history from a time before AMR existed. Lower had met Gleeson and her sister at the Buck Ambulance's 100-year anniversary a few years ago and agreed to pass the scrapbook on to Gleeson. Coincidentally, Gleeson had just attended a Historical Society meeting and recently donated a Boones Ferry Days Beer token to the archival collection. So when she received the scrapbook, Gleeson called Schenk. "She said, 'Can you explain this mystery? Dave Lower just gave me my father's scrapbook.' I said, 'What? You live in Wilsonville?' She had been coming to our historical society meetings and had just donated a couple items for our archives without any knowledge about the scrapbook," Schenk says. Schenk says no one with the historical society knows who donated the scrapbook. And while much of its contents dated back to the 1920s and '30s, the Historical Society wasn't formed until decades later. Gleeson's grandparents moved from North Portland to Wilsonville to retire in 1949 and her parents moved there in 1976. Gleeson and her husband built a house next door in 1980. "I was at my grandparents' house from the time I was 4 years old and played over there," Gleeson says. "It was wonderful having my parents right next door, absolutely fabulous." Yet despite being close with her grandparents and parents for much of her life, Gleeson had never seen any of the memorabilia documented in the scrapbook and neither had her sister. But it's obvious who organized the mysterious book. The first page of the scrapbook reads: "'To the best son I ever had with lots of love and good wishes.' Mother, 1933." Gleeson says her grandmother Kathryn was particularly fond of Bernard but isn't sure why she didn't share the scrapbook with anyone or why the book only depicts Bernard's early years. "Maybe she (Kathryn) wasn't the belle of the ball anymore and my mother was," Gleeson said. "I don't know." The book includes newspaper clippings of Bernard's adventures in the Hill Military Academy, a college preparatory and military academy that closed in 1959, an article about Bernard assisting births in the back of a Buck Ambulance, a graduation certificate from Alameda Elementary School, a picture of his high school cross-country team, a Halloween Party invitation and information about Bernard's piano recitals. There was also a newspaper clipping about Gleeson's grandfather Ben, who founded Buck Ambulances, that says "Newlywed stolen but makes escape," which is about how Ben's friends kidnapped him on his wedding day. "I never knew (that he played piano). I didn't know he was on the cross-country team," Gleeson says. "I never thought of my father as an athlete. I thought of him more as a prankster." Gleeson also found a menu of a restaurant in Nebraska, where sandwiches cost only 20 cents. "I never heard my grandmother talk about going to Nebraska and why that's in there I have no idea," she says. On the not-so-pretty side, Gleeson found a Christmas card that uses negative stereotypes about the dialect of African Americans. "Those were the times and it shows how times have changed," Gleeson says. "That's appalling." Unlike her grandmother, Gleeson says she is "not a scrapbook person" and has only kept the most significant items from of her son's childhood. And, as the owner of a flip phone, she doesn't take many pictures either. But she plans to give the scrapbook to her son. "He's interested in seeing it of course and he'll probably keep it until his kids find it in the drawer and then they'll say 'What is this?' And they'll throw it away," Gleeson says. As part of the archival process, the historical society is trying to keep a better record of who donated which items so that future generations will be afforded more clarity than Gleeson. With the originator of the scrapbook long deceased and the historical society having no idea who donated it, Gleason is not confident anyone will ever find out how the scrapbook ended up in the historical society's collection. Due to gender norms, Gleeson said she knew her mother much better than her father, Bernard. So, though perplexed about its origin, at least the scrapbook was clarifying. "I find it more interesting than anything," she says. "I like family history and it validates things."